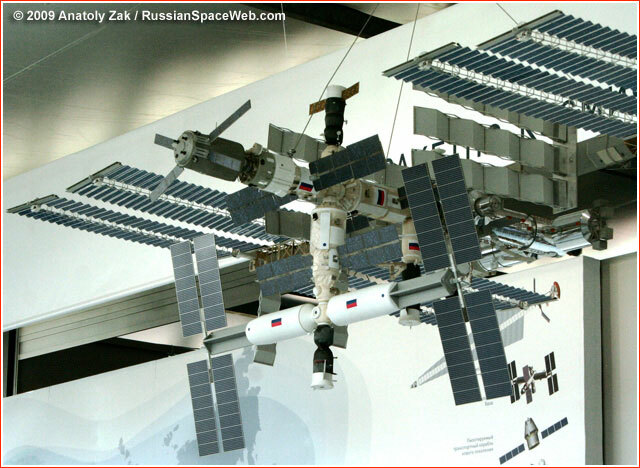 A scale model at Moscow Air in Space Show, MAKS-2009, demonstrated a planned configuration of the ISS by 2015. Russia first appeared on the scene of what would become the International Space Station after NASA had concluded that it would be able to address the issue of the emergency return from the station quickly and economically by incorporating the veteran Soyuz spacecraft into the design of the outpost. On June 18, 1992, NASA Administrator Daniel Goldin and Director General of the Russian Space Agency Yuri Koptev "ratified" a contract between NASA and NPO Energia to study possible integration of Soyuz and Russian docking ports into the Freedom project. Zarya ("sunrise") control module became the first element of the ISS to be launched. It was used for maneuvering and power supply at the initial phase of the flight and later became a storage vehicle. The Zvezda service module is Russia's main contribution into the ISS project. The spacecraft was originally conceived as a core of a space station, which would follow Mir. In 1993, the Russian Space Agency, facing financial uncertainty with its Mir-2 project, offered NASA to incorporate the core module into the design of the US space station. The spacecraft would provide living quarters as well as refueling capability to the fledgling space station. It also contained a treadmill for the crew. The Docking Compartment provides a hatch one meter in diameter and the airlock for the space walks from the Russian segment of the station. (NASA plans its own, larger airlock attached to the US segment of the outpost) The Docking Compartment will also provide a third docking port for the Russian transport ships heading toward the station. The concept of the module was originally developed for the Mir-2 project. The concept of the Science and Power Platform, NEP, originated in the Mir-2 project, where a special truss was expected to carry an array of solar panels, power-generating concentrators, radiators and scientific payloads. The truss would extend symmetrically on both sides of the Mir-2's core module. After Russian Mir-2 and NASA's Freedom programs merged in 1993, NEP was reconfigured to meet goals of the new project. Universal Docking Module, USM, (sometimes referred to as UDM) would serve as a hub for four additional modules of the Russian segment. The 20-ton vehicle was to dock to the nadir (Earth-facing) docking port of the Zvezda service module. On the opposite (bottom) end, the UDM would have a transfer section with five docking ports for science modules, Docking Compartment-2 and transport ships. At least two modules specifically dedicated to the science research were planned to be docked to the Universal Docking Module, UDM. One of the modules could be built by the Dnepropetrovsk-based KB Yuzhnoe as the Ukrainian contribution into the ISS. In any case, RKK Energia was expected to serve as main subcontractor on the project. As of 1994, an additional stowage module could be docked to the nadir (Earth-facing) port of the Zarya control module. However, RKK Energia and Khrunichev respectively proposed the Enterprise module and Commercial Space Module, CSM, to replace the original stowage module. The concept of the MSS module remained on paper. At the end of 1999, the US-based Spacehab Inc. announced a joint venture with RKK Energia aimed to build the first privately financed and operated module for the ISS. The spacecraft originally targeted for launch at the end of 1992, would feature "a multimedia studio" for commercial broadcasts from orbit. Before the module could become a reality, Spacehab had to address multiple issues, among them cool reception from NASA and lack of energy and communication capabilities onboard the Russian segment. The Mini-Research Module 1, MIM-1, Rassvet (Dawn) became the fifth permanent element of the International Space Station built in Russia. The spacecraft was essentially a stopgap measure to fill the nadir (Earth-facing) docking port on the Zarya FGB control module of the outpost. Without some kind of extension, an originally planned addition of NASA's Node-3 module to a "next-door" nadir port on the Unity/Node 1 module of the American segment would block a safe access of the Soyuz spacecraft to the Russian segment. As the construction of the Russian segment of the International Space Station, ISS, was about to pick up in the mid-2010s, the crews onboard the outpost would also refresh their wardrobes. By 2013, NPP Zvezda enterprise based in the town of Tomilino, southeast of Moscow, developed a new version of the venerable Orlan spacesuit, which were worn by pairs of Russian cosmonauts during as many as 135 spacewalks. The upgraded suit was dubbed Orlan MKS, where MKS stood for the Russian abbreviation of ISS. By mid-2000s, RKK Energia added a new element into the possible future configuration of the International Space Station, ISS, called "Uzlovoi Module" or Node Module in English. Despite its small size, a four-ton, ball-shaped module could play an extremely important role in the Russian space program. While planning for the expansion of the Russian segment of the International Space Station, ISS, in the second half of 2000s, engineers at RKK Energia conceived a new Airlock Module, ShM, which would replace a Docking Compartment, SO, currently used for spacewalks. The new design also evolved to support the orbital assembly of deep-space vehicles. Around 2012, the Russian space agency, Roskosmos, quietly replaced a highly advertised first launch of the nation's cosmonauts from the new space port in Vostochny with an automated space lab. The Oka-T module designed for periodic servicing by space station crews in orbit should provide an exit strategy for the Russian space officials, who made an impossible promise to the Kremlin to fly a manned mission from the new space center in 2018. Half a century after Aleksei Leonov floated into open space through the inflatable airlock, the company that built his spacecraft, has jump-started work on multi-layered inflatable structures. In its annual report for 2012, RKK Energia said that the new project might pave the way for a new generation of space station modules, interplanetary spacecraft and planetary bases. In 2017, Russian engineers formulated the concept of a tourist module to be included into the Russian segment of the International Space Station, ISS. It would be built on the basis of the second copy of the Science and Power Module, NEM, which was in active development at the time. Money provided, the NEM-2 module could be launched as early as 2023.